Our Made To Measure Snap Frames are bespoke to your requirements. 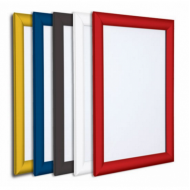 Our Custom Aluminium Snap Frames are available with 32mm or 25mm frame extrusions, up to a maximum size of 2300mm x 2300mm, in almost any RAL colour (some particularly obscure RAL colours may not be available). They are manufactured at our facility in the UK to the highest professional standards, usually with 7 days from the time of order (lead times can vary depending how busy our workshop is. Bespoke Snap Frames, Custom Made to Order available in all models and colour finishes, with 25mm or ..